This is the designated neighbourhood zone for Deepdene Primary School in Melbourne, Victoria. You can search for a particular school or address in the search box in the top right-hand corner of the embedded map or zoom into an area of interest on the map. This is the designated neighbourhood zone for Coatesville Primary School in Melbourne, Victoria. You can search for a particular school or address in the search box in the top right-hand corner of the embedded map or zoom into an area of interest on the map. This is the designated neighbourhood zone for Chatham Primary School, in Melbourne, Victoria. You can search for a particular school or address in the search box in the top right-hand corner of the embedded map or zoom into an area of interest on the map. 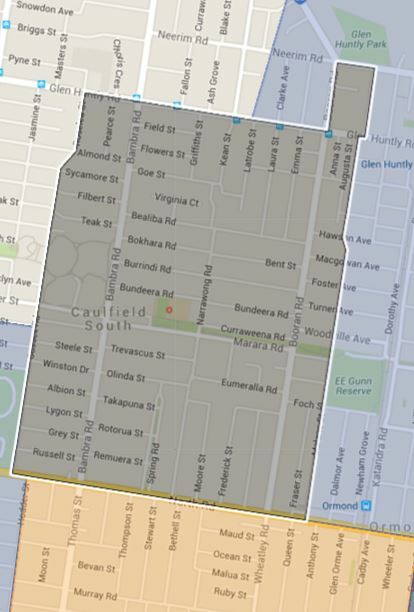 This is the designated neighborhood zone for Caulfield South Primary School in Melbourne, Victoria. This is the designated neighbourhood zone for Caulfield Junior College in Melbourne, Victoria. You can search for a particular school or address in the search box in the top right-hand corner of the embedded map or zoom into an area of interest on the map. This is the school catchment map for Endeavor Sports High School in Sydney, NSW. This is the designated neighbourhood zone for Carrum Primary School in Melbourne, Victoria. You can search for a particular school or address in the search box in the top right-hand corner of the embedded map or zoom into an area of interest on the map.